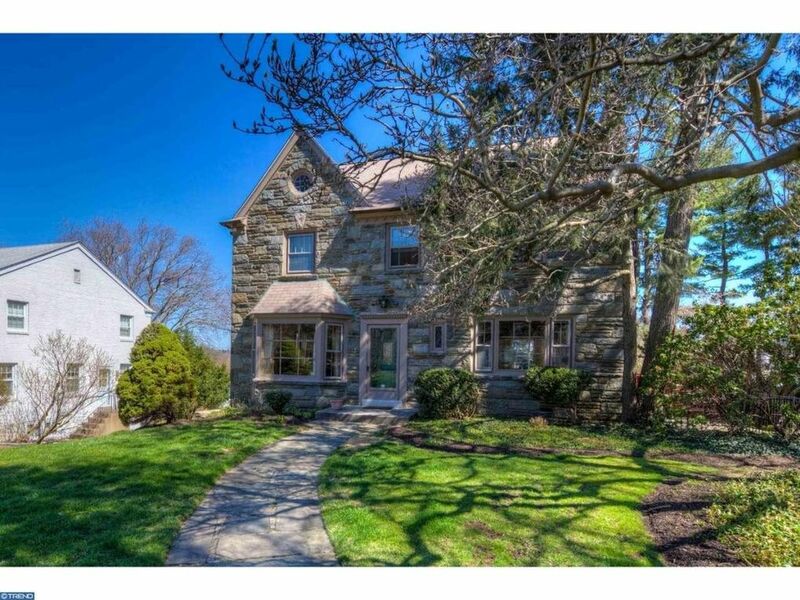 Lovely Stone front 2 story center hall Colonial on one of the prettiest tree lined streets in Cheltenham is waiting for its next owner. It does not take much imagination to see all the potential this home offers. Must see the large living room and dining room with beautiful hardwood floors, deep window sills, and crown molding. LR has marble surround fireplace wood burning fireplace and shuttered door that leads to a sunny side patio. Adjacent to the LR is a sunroom with glass doors that could be used as an office or playroom with views of the rear yard. The DR features a Bay window and side windows that allow for plenty of light. The charming kitchen is functional with wood ceiling, pantry closet, tiled backsplash and countertop with an adjoining 11 x 8 breakfast room and large picture window. A door from the kitchen leads to a huge outside deck for outside entertaining. A powder room and true coat closet complete the first floor. Upstairs are 4 bedrooms and 2 full baths. The spacious Master BR has wood parquet floors, 3 closets, and private master bath w tiled shower. Three additional bedrooms all have ceiling fans (one BR is currently used as an office). Upstairs hallway has access to a large attic. Lower level has 23 x 13 finished area used as Exercise Room/Play Room in addition to a mudroom/laundry room with a powder room and shower, storage room, closets and access to the 1 car garage. Newer 50 gal. hot water heater, 3 zone gas hot water heat, and central air. Excellent location, quiet street, great schools, easy commute to Center City, Rt. 309, shopping and parks.